The women who were arrested on Sept. 28 were released by police with citations to appear in court in December. "There is no such thing as a peaceful, safe, renewable and cost-effective nuclear power facility," Nestel said. The Vermont Legislature will make history in a vote expected as early as January on whether to allow Vermont Yankee to continue operating after 2012. Never before has a state taken such a vote. "This is a tremendous opportunity for us," said CAN director Deb Katz. "But it's not going to be easy." 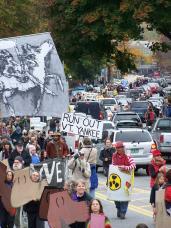 Three years ago the Vermont Legislature passed, and the governor signed, Act 160, which gave the Legislature the authority to decide whether Vermont Yankee can operate after 2012. Because of the way the law was written, the governor will not be able to veto the Legislature's decision. Entergy has been pouring money into lobbying in anticipation of the vote. Entergy has run full-page ads in Vermont newspapers and frequent radio commercials. Volunteers with the Vermont Public Interest Research Group (VPIRG), the state's biggest environmental organization, have spent the summer knocking on doors and speaking with people about why Vermont Yankee should be closed. "We've been finding tremendous support for closing Vermont Yankee," said VPIRG director Paul Burns. "This will be one of the dominant issues in the next legislative session. Because of the way the prevailing winds blow, New Hampshire would probably be most affected by an accident. So we're getting support from people in New Hampshire and Massachusetts, too." In 1949, the Soviet Union became the first country besides the U.S. to detonate a nuclear bomb. Soon after that, Congressman Chet Holifield said, "We cannot be indifferent to the enormous psychological advantage that the Soviets would gain if they demonstrated to a tense and divided world the ability to put the atom to work in peacetime civilian pursuits&. The United States will not take second place in the contest." Bob Mulholland ran a successful campaign to close the Rancho Seco nuclear power plant near Sacramento, Calif. Rancho Seco was closed in 1989 because the people of Sacramento voted to close it. Mulholland, who now works for the California Democratic Party, told the Valley Post that the nuclear industry dramatically outspent the antinuclear groups in advertising before the referendum vote.